The last game in KOEI's acclaimed Romance of The Three Kingdoms series to be released in English, Romance of The Three Kingdoms IV: Walls of Fire ends in a disappointing note for long-time fans of the series, although still packing enough punch to entice newcomers to KOEI's unique blend of Oriental history, myths, and personnel management in a wargame. 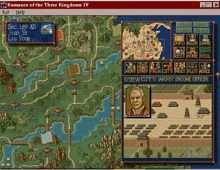 For those who are unfamiliar with the series, Romance of The Three Kingdom is a turn-based wargame set in 8th Century China, when many warlords vied for the Imperial throne and the chance to unite the nation. The game is largely based on an epic, semi-historical literature of the same name. While RtK IV has many exciting new features that will delight fans, it also seems to contain at least as many disappointing features (or lack thereof) that overall make the game less enjoyable than RtK III. Let me start with the high points. First of all, RtKIV introduces magic to the series. Historical buffs will definitely raise their eyebrows, but I think the addition adds an interesting facet to combat, and is in keeping with Chinese folklore on which the literature itself is based. There are three magic abilities at your disposal: "Wind" changes wind direction in battle; "Weather" lets you control the weather in combat; and "Bolt" calls down bolts of lightning during combat. Combat in RtKIV is also much grander in scale than RTKIII: when you attack a city, you only see one small section of the wall, around the gate to the city. This might disappoint fans who like the city-wide battles of RTKIII (myself included), but the bigger scale does represent history much more closely. One of the best new features is that officers now have skills in addition to their stats. You have to therefore choose commanders carefully, since a warrior with high strength level may have no military skills (such as infantry or cavalry) may be less useful than a weaker warrior who has high leadership and military skills. In addition, every officer that are not created by the player is a real historical figure (or at least appears in the literature), and you can read everyone's short biography that describes what he/she did in history. This makes the roleplaying aspect of the game much more enjoyable and even educational for anyone interested in Chinese history. Other welcome features that enhance the roleplaying aspect include: military consultations with your commanders, wise men that wander the land, eavesdropping on generals talking to each other as they carry out your orders, listening to your troop's gossip about you, etc. There are also many more options for rulers in exile, and you can now create whole families for any one of your officers, since they can now have kids. Unfortunately, RtKIV also has many weaknesses that greatly dilute the fun factor. First and foremost, the game is simply too easy-- I finished it it much less time than it took me to finish the previous RtK games. Computer AI seems to take the turn for the worse, as it rarely takes advantage of poorly defended cities, and makes very irrational decisions in battles. You can even win the game by discovering the Hereditary Seal and take the Imperial city of Loyang, without having to kill every other warlord. And while magic is fun to use, many options from the previous series, e.g. hiding your men in forests for ambush, are strangely missing in the game. Overall, I'd still rate the game Top Dog for the fact that it's still fun to play, especially for anyone who's never played the previous games. Die-hard fans will be disappointed, though, especially at the lack of city-wide battles of RtKIII and the stupidity of computer players. Recommended, but only to anyone new to wargames or is interested in Chinese history.